Minden, NV- On October 3, 2017 Maxton Manufacturing Company provided the last of 4 elevator control valve training classes at MEI in Mankato, MN. These classes were part of the Maxton NAEC approved CET 4.0 credit hour class covering issues with hands on valve adjustment /trouble shooting, temperature, contamination, pressures and how to handle or prevent these problems from occurring. 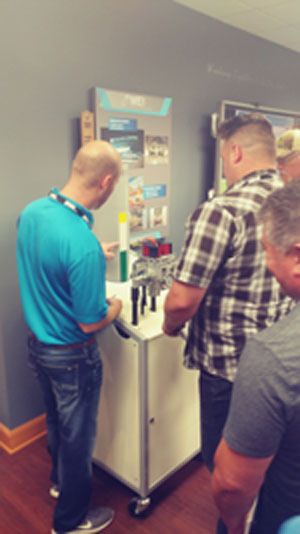 MEI had elevator mechanics, apprentices and staff from nearly all their business units across the country in attendance during the multiple sessions this year. 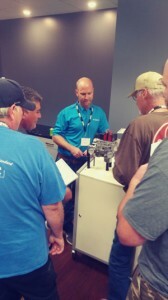 “The Maxton valve training has been a valuable training for our MEI Mechanics. We have done it quarterly for the past year and have had good feedback from our Mechanics saying they really learned a lot from it. They love the hands-on approach that the training includes so they learn about the mechanics of the valve, tips and tricks on troubleshooting and then have a break it- fix it session with a training unit that they send along to reinforce what they learned. We would highly recommend this training to any Mechanic in the field”, said Nicole Smith Marketing Supervisor at MEI. “Both of the mock up testing equipment and the instructors from Maxton were above my expectations. Please consider having them back again in the future”, said Kris Kruger Service/Repair Supervisor at MEI. “It was great to get 43 people broken down into smaller groups during four sessions this year. The students get more hands-on time as individuals this way and further raise their confidence working with the valve.” Billy Shrum Technical Manager at Maxton. It all started for Maxton Manufacturing Company in 1968 growing into a worldwide leader that holds the distinction as the largest single producer of hydraulic elevator control valves in North America (Made in USA). We serve all your OEM, new construction, modernization, replacement/repair, tech support and educational needs when it comes to the products we provide. It’s time…explore our website http://maxtonvalve.com for access to the resources you need daily…Maxton Mobile Mechanic APP, 4.0 credits NAEC approved CET class, product specification information, free field training software, our newsletter, and how to contact us.